How may of us just grab the guitar, take a seat and begin to play? How many of you really understand the importance of proper posture, it’s effect on your playing and risk of injury. More and more I see beginners sit in the way their favorite player does, without regards to their body. The common way to hold the guitar is to sit with both feet flat on the floor and hold the guitar on the right thigh. Well, what is the matter with this? The problem with this kind of posture is that everything is out of alignment. 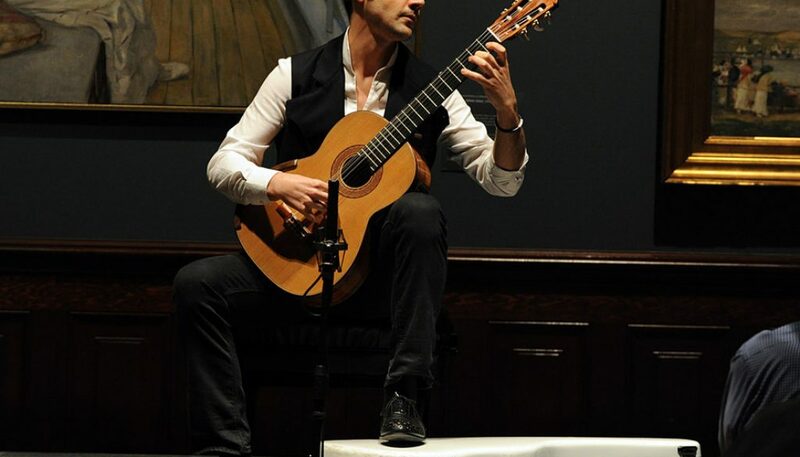 In this posture you can grab simple open chords and maybe play some scales on the first three strings, but try to play a bar chord or run through a closed position Major or minor scale. The fact of the matter is that unless you are a circus contortionist you can’t do it. The only good thing about this posture is that both feet are on the floor. By having your feet on the floor this relieves stress on the lower back. The first thing you need for your ultimate playing position is the ultimate chair. Many people just grab a chair and go for it. The ultimate chair however has to have a few key characteristics. The first is that the chair should have no arms, the last thing you need is the arms of the chair interfering with the movement of you left or right arms. The second is the height of the chair. When choosing a chair stand in front of it so you are to the side. The seat of the chair should fall right in the middle of your knees. Another way to test it would be to sit on it, if you feet are flat and your lap is flat, then it is the right height. However, if your lap angles to the floor it is too high, or if your knees end up pointed to the ceiling it is too short. Your personal chair will depend on your height, and vary person to person. The second thing you need is a foot stool. This is so that you can elevate your left foot to rest the guitar on the elevated thigh. One of the things that has become quite popular ( and what I use) is an “A” frame. The “A” frame attaches to the guitar by suction cups (although some clamp on) and elevates the guitar to the proper height while allowing you to keep both feet on the floor. Some people even use a combination of “A” frame and foot stool to achieve maximum support. The foot stool is the most secure thing to use as far as guitar support but the fact is is that by having that left foot elevated, it causes a lot of stress on the lower back. If you use a foot stool try to keep it as low as possible, this reduces lower back strain. Thirdly, sit on the edge of the chair and do not slouch when you sit. Sit with your back straight, it is okay to look at the guitar and your hands, it is not okay to lean over and look at your hands. Keep your shoulders level, and don’t lean to the left or to the right. However, there will be times when you will lean to the left in order to reach those notes above the twelfth. Make sure you recover your posture after playing those types of passages. Many people don’t know what to do with the right foot, it just seems to be there. You must be careful in which position you place the right foot because it is an easy target for excessive tension build up. I like to keep the right foot relaxed and sometimes in a position when it is almost fully extended and on the heel, some like to keep it bent back under the chair on the ball of the foot. Whatever your preference keep in mind the mid range principle, which was advocated by Aaron Shearer. All of our joints can function within three realms of movement. The first is to the extreme left or up. Try this: Hold your hand out in front of you and curve your wrist to the extreme left. Now try to wiggle your fingers. Not very comfortable is it. Do the same experiment but this time curve your wrist to the extreme right, which is the second realm of movement. You will see that this is not so comfortable either. Now, hold your arm out straight without deviating the wrist to the right or left. Now, wiggle the fingers, this should present no discomfort or awkward feeling. This is the mid range, or the range between the extremes. This is where the most comfort and economy of energy reside. The same is true with the waist. This is why you want to avoid leaning too far forward or too far back. Your hands should fall very naturally to the side of your body, then raise them to the guitar. You want to avoid the “chicken wing” syndrome of shooting out the left elbow at certain points of a work. The reason to avoid this is excessive tension. As you go through and look at your posture you should eliminate everything that causes excessive tension. I say excessive, because you will have some tension. After all, you are using various muscles to play guitar, and support yourself and the instrument, and all muscular exertion causes tension. There is though, a difference between wanted tension and unwanted tension. So in conclusion, go through your posture this week and really be honest with yourself about what is good about your seating position and what is bad, and do not be afraid to really be truthful, about the bad. After all, once we have eliminated all that is imperfect, what remains is perfection. Logan L. Gabriel lives in southern New Hampshire where he is an active teacher. He has released a CD entitled Tree and Leaf: Original Music for Solo Guitar. This is a topic near and dear to my heart. I don’t recall my teacher telling me about posture but I surely make my students aware of it and help them to understand it’s importance. Excellent observations and advice — thank you!